FACEBOOK IS JUST TOO CHATTY! Well, first, I learned that Facebook is turning t his into a much-too chatty world. 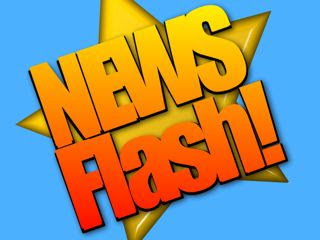 For example, I learned last night from her Facebook page that Daily Pilot Newport Beach reporter, Brianna Bailey, has given her two weeks notice yesterday and is apparently returning to Oklahoma and will go to work for the Journal Record, reporting on the energy industry. OK, I understand the need to share this good news, but this old geezer is having a hard time adjusting to this information being broadcast to the world via Facebook. Oh, well... we wish Brianna well - she's done a good job here. 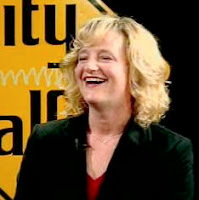 Facebook also affirmed for me that there are actually six Katrina Foley's running around these days. There simply is no other explanation for the number of events she attends. Either that or she is a butterfly, flitting from flower to flower. Perhaps she is the Energizer Bunny incarnate. Whew! 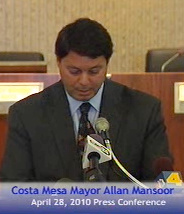 Early in the week I learned that Costa Mesa Mayor Allan Mansoor, ever the opportunist, has decided to jump back on the old "immigration horse" that got him re-elected four years ago. Yep, he called a press conference Tuesday to announce his new initiative to crack down on illegal aliens in our midst - again - denying all the while that neither his campaign nor the recent Arizona law had anything at all to do with the timing of his announcement. Those who were around these parts in the middle of the last decade will recall that he pulled this stunt before, trying to get all Costa Mesa cops designated as immigration screeners. 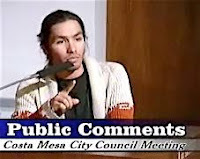 For months it seemed that every wacko on both sides of the issue descended on our town, demonstrating and disrupting council meetings, including the incendiary event of Benito Acosta's arrest. That little judgment lapse on the part of Mansoor ended up costing the City over a half-million dollars in legal costs. Now he's at it again, trying to find a campaign platform in his run for the 68th Assembly District seat in Sacramento. What does he care if this, once again, polarizes the city and leaves an irreparable rift in our communities - one way or the other he's not going to have to deal with the problems he's creating. I learned, or, rather, had reaffirmed, that Eric Bever is intellectually and emotionally unsuited for public office. His infantile publication of an "open letter" to the City Council by way of the Daily Pilot in which he renounced his support of the City's on-going project to acquire the Orange County Fair and Events Center because Governor Schwarzenegger didn't give the City enough time to get the job done properly was akin to some spoiled little brat, flailing around on the floor screaming, No! No! No! because he was being asked to do something he didn't want to do. This, of course, is vintage Bever - a man who clipped his waist-long pony tail before he ran for office to disguise who he was. This is Bever, who missed many of the important meetings on the issue and has for the most part restricted his contributions during the discussions to lame quips and other failed attempts at humor that have become his pathetic trademark. I learned that my old buddy, Chuck Cassity, is one funny dude. I'm sorry, but he just cracks me up. Last week he published a couple blog entries on his "Chuckmeister Unleashed" blog that address the immigration issue. You can find them HERE. We've got an interesting city council meeting coming up on Tuesday - could be a long one. I'll write about that on Monday. Have a great weekend and don't get caught in the Orange County Marathon traffic on Sunday. As mentioned in my earlier post, the streaming video of Allan Mansoor's press conference yesterday is now up and available for viewing on the city site. You can see it HERE. Unfortunately, only half the event is available - the first portion where the mayor read his prepared speech - so you'll get to see a lot of the top of his head. According to Dane Bora at the City, he's working right now trying to clean up the audio feed on the second portion of the press conference - the Question and Answer section. If he can clean it up sufficiently so at least some of the questions can be heard and understood he will re-post the entire conference. If and when that happens I'll change my link to the new one. *** The "long version" of the city link is now available... I've changed my link so you can now see the entire 42 minutes. In the meantime, there is an alternative. 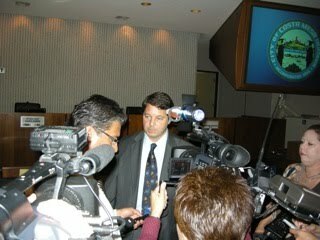 Our friend, John Earl over at the OC Voice blog was there, sitting in the front row with his camera and has posted his unedited clip of the press conference. The quality isn't as good as the city feed, naturally, but he does have the entire press conference posted for your viewing. You can see it HERE. And, as you all probably know by now, Mansoor is, once again, being re-anointed as an immigration rock star - his smiling face was all over the news last night again. This is, in the word of Yogi Berra, "deja vu all over again". This is exactly what happened five years ago when Mansoor launched his ICE proposal and ended up on national television as the poster boy for intolerance as he attempted to create his own immigration policy. So, dear readers, this is what you're going to see until November. Mansoor will jump up in front of any camera available and bemoan our immigration situation. Makes me want to puke! 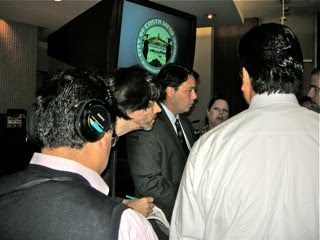 As promised, I did attend Mayor Allan Mansoor's campaign event, er, press conference at City Hall this morning. It's taken me a little while to post this because I actually stayed for the entire event, including the one-on-one question and answer period with the press that followed his formal presentation. One wag in town, a guy who fanci es himself a journalist, arrived late, stayed for about 10 minutes and then left early - burning rubber out of the parking lot so he could rush home and post a blog entry that said nothing. He apparently didn't want to be noticed because he came in disguise, not wearing his trademark black shirt for a change - maybe it was in the wash. But, he was seen in "his" seat - in the far, right, back corner of the auditorium. The meeting was sparsely attended. The working pres s outnumbered residents and other visitors about 2-1. Although I sat near the front so couldn't keep close track of the comings and goings, my occasional peeks over my shoulder revealed that, in addition to the brief stay by the guy normally in black, among those in the small audience were Councilwoman Katrina Foley, Planning Commissioner Steve Mensinger - both made brief appearances - and Benito Acosta, he of recent lawsuit fame. There were around 10 members of the working press - print, radio and television - and a couple of us bloggers, too. I think there might have been 25 people in the auditorium at the peak of attendance. It was a pretty skimpy turnout for an issue with, as we've seen in years past, the potential to generate heated passions. Mansoor arrived late to the press conference, which was promised to begin "promptly" at 10:00. It did get started at around 10:15 and lasted about 45 minutes. CMTV taped the proceedings and I've been told that it will be available for viewing via streaming video at the city web site tomorrow morning. You can click on the "archived video" link on the city home page to locate it after 8:00 a.m. So, what was this all about? I'll try to boil it down as much as possible. The mayor is concerned about illegal alien criminals in our city and wants to discuss new programs to address them. Mansoor outlined four items he wants to pursue with the ci ty staff and his peers on the council. 1- Requiring the use of E-Verify for all city contractors and the people they employ. 2 - Requiring the use of E-Verify for all businesses applying for a business license in our city to be sure that all businesses and their employees are legally able to work in our country. 4 - "Have discussions toward a more clear policy on how we handle foreign nationals with a strong emphasis on proper pro-active training". 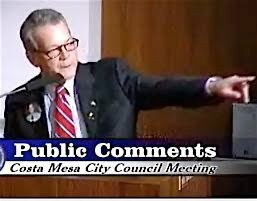 COSTA MESA NOT A "SANCTUARY CITY"
He went on to state that, "Costa Mesa is not a sanctuary and is, in fact, a "rule of law" city when it comes to upholding our immigration laws and I will ask the council to commit to make it official." WHY NOW, MR. MAYOR? It seems our former deputy sheriff/mayor has conveniently chosen this time - a few weeks before the primary election in June - because "it's been on my mind a long time and it needs to be addressed". When the press pushed him about the timing he denied that the election had anything to do with it. When pushed further he admitted that all the turmoil in the city recently - the budget, fairgrounds purchase, ACLU lawsuit for day laborers, etc., caused him to delay presenting these issues for discussion. From my standpoint, I don't believe that for a minute. I think he is running for Assembly and is facing a strong opponent from the Vietnamese community in the primary early in June and possibly again in November so he needs an issue to hang his campaign on. As has been the case in the past, that issue is immigration, even though the resolution of immigration problems are the purview of the Federal Government, not cities. This is precisely what he did four years ago when he and Wendy Leece rode to victory on the backs of the Latino population of Costa Mesa. MATRICULA CONSULAR AS VALID ID? In response to a question from the media he brought up the issue of the validity of the Matricula Consular - the identification cards provided by foreign consulates to citizens of their countries. Here we're talking about Mexican citizens. This form of identification is controversial and Mansoor wants to have the city take a position on the validity or lack thereof of those instruments when "criminals" are stopped for traffic infractions and the like. He feels that anyone here legally should have a valid driver's license or passport or visa. He stated that anyone holding a Matricula Consular is probably here illegally and should be deported. Mansoor threw around statistics about the criminals deported by ICE in 2009 but he didn't provide anything to compare them to - if ICE had not been in the jail in Costa Mesa, for example. When the press challenged him on the issue of his promise that his ICE plan would be directed at "dangerous felons", when more than half those he's taking credit for were for lesser crimes, he dodged the issue. Mayor Mansoor has ripped the scab off an issue that has festered in our city for five years. By bringing it up now he guarantees himself another term in the spotlight o f national television as he makes a bid for Van Tran's 68th Assembly seat. He couldn't buy this kind of media coverage! As he spoke and answered questions I found myself thinking that this has a very familiar ring to it. If this process goes as it appears he wants it to - a request to place the issues on a study session agenda, then later to be considered by the council in open session - I can foresee more packed meetings with vocal proponents and opponents batting the issues back and forth in the same kind of atmosphere we saw in the past. Heck, we've already had Minuteman Jim Gilchrist post a comment on this site today and the ball is barely rolling! 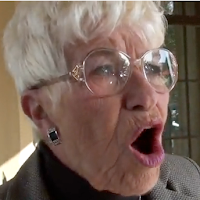 I fully expect to see Barbara Coe stumble into our council meeting in the near future. Speaking o f which, tonight Mansoor will toddle off to a fund raiser hosted by that self-same Barbara Coe and her minions at the California Coalition for Immigration Reform (CCIR) meeting at which his praises as the "savior of California" will almost certainly be sung. What's that old phrase, "You are known by the company you keep?" Well, somebody should have reminded Mansoor of that fact. I've got a feeling that it's going to be a long, long summer and that Mansoor's campaign is going to be something very interesting to watch. By proposing policies that will bring down the hammer on Costa Mesa Latinos he guarantees a busy time for the Costa Mesa Police Department until November. Well, how's that for a bit of fortuitous timing? One minute past the close of business today, at 5:01 p.m., and not too long after I posted my last entry, I received a press release from the City of Costa Mesa announcing that Mayor Allan Mansoor has called a press conference at 10:00 a.m. Wednesday, April 28th in the City Council Chambers to discuss immigration. In a campaign year when he's trying to take the big step to Sacramento, I guess the recent new law in Arizona has given him just the boost he needed to dredge up his favorite subject. According to the press release, Mansoor will provide an "overview the success of the City’s ICE program and outline additional proposals he will be bringing before the City Council for discussion and consideration." The press conference will be open to the public. "ICE" SUCCESS AND NEW "OPPORTUNITIES"
Mansoor is quoted as saying, "I believe our City has set the example for communities nation-wide in terms of our commitment to support the upholding of immigration laws at the local level. The results of our efforts speak for themselves although there is much more that can and should be done. The purpose of this Press Conference is to highlight the successes, identify opportunities for more effective enforcement, and to highlight additional measures that I will be proposing to my fellow City Council members for further review and discussion." I expect there may be a packed house to morrow because it seems he's going to thump himself on the chest about his "great accomplishments" with "his" ICE program. Of course, it really isn't the program he wanted - it's one he had to settle for. One never knows what he has up his sleeve, but when he tells us he's going to "identify opportunities for more effective enforcement" and that he will "highlight additional measures", you know this isn't going to be good news for the Latinos in our community. 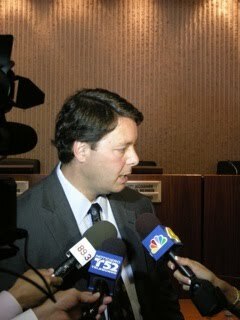 A NEW COSTA MESA IMMIGRATION LAW? I wouldn't be surprised if he will attempt to propose a new municipal ordinan ce along the lines of Arizona's state law that will permit Costa Mesa cops to stop anyone they choose to ask about their status in this country. Suffice it to say that we will make every attempt to attend this press conference to hear exactly what Mayor Mansoor has on his mind. And, of course, this dovetails nicely into his fund raiser at the California Coalition for Immigration Reform (CCIR) meeting tomorrow night. Nobody ever said he wasn't an opportunist! 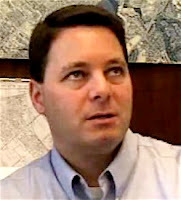 While tu rmoil continues to swirl around Costa Mesa Councilman Eric Bever for his capricious decision to withdraw his support for the City's bid for the Orange County Fair and Events Center his (former?) pal and former Orange County Deputy Sheriff, Allan Mansoor, is on the campaign trail. My Google Alert system barfed up a little notification this morning that I thought I'd share with you. Seems Mayor Mansoor is guest of honor at a meeting of the California Coalition for Immigration Reform (CCIR) tomorrow evening, Wednesday, Ap ril 28th. You can read the announcement in full HERE. In case you don't know about the CCIR, it was founded by racist Barbara Coe more than 15 years ago. Coe, among other things, was an officer in Jim Gilchrist's Minuteman Project until they had a spat over who was running the show. You can read more about the CCIR HERE. A few years ago, when Mansoo r was being honored at another CCIR event, he was named an honorary member of the Minuteman Project. Since that time opponents of his plan to designate every single Costa Mesa police officer as an immigration screener began referring to him as "Minuteman Mayor" or "Minuteman Mansoor". I point out Mansoor's participation at this meeting because I've recently heard some observers speculate that he might steer clear of the extremists who support him to broaden his appeal for his run for Van Tran's 68th Assembly seat this year. Obviously, that is not the case. Nope, he will continue to embrace those folks and, apparently, vice versa. He will continue to pander to the extremists among us to garner votes, just as he did when he rode the backs of Costa Mesa's immigrants to victory in his Costa Mesa council campaigns. As the campai gn season moves forward we'll be addressing Mansoor in depth, including an assessment of his campaign contributors. We'll keep that for a future entry, but some of the numbers are very interesting and illuminating.